The Mini Countryman may have been unveiled last month, but the LA Auto Show has been our first chance to have a proper poke around. From the offset, it’s clear that size matters. The Countryman has grown in length (20cm), width (3cm) and wheelbase (7.5cm), and looks noticeably larger than its predecessor. The redesigned and squared-off rear end may have created a slightly boxier silhouette, but it offers more practicality with better access and space for rear passengers, as well as more usable boot space. The rear seats remain easy to tumble, plus there’s now an optional, foldable picnic bench – essentially a giant cushion – that allows you to sit on the rear sill. The cabin, too, is a step up in perceived quality, with a broad mix of high quality materials and a new touchscreen that fits into a pizza plate-sized central display and incorporates MINI Connected, the infotainment system that incorporates phone, music and navigation, allowing you to plan your trips before you even get into the car. 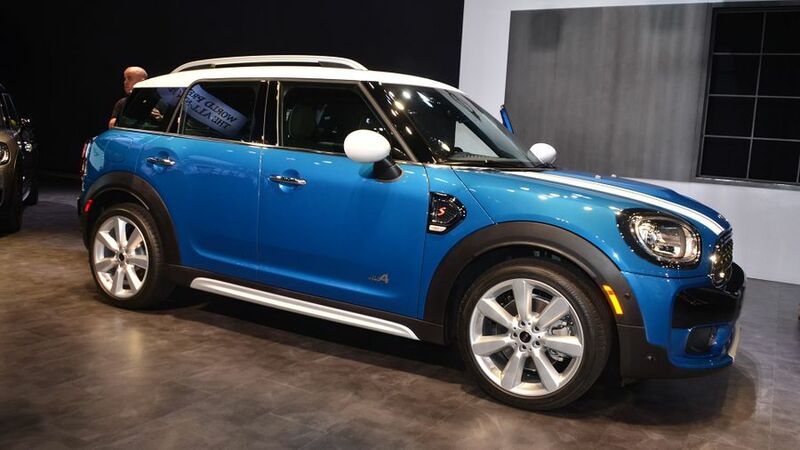 This being Los Angeles, the emphasis was on the Mini Cooper S E Countryman All4 – the company’s first (and elaborately titled) plug-in hybrid. Essentially, it uses the same technology that has been showcased in the BMW i8 supercar, including the same turbocharged 1.5-litre, three-cylinder petrol engine with 132bhp up front that drives the front wheels. There’s also a smaller 86bhp electric motor on the rear axle driving the back wheels, powered by a lithium battery pack that is guaranteed for eight years. Despite adding 150kg to the kerbweight of an equivalent petrol-powered Countryman, Mini claims 0-62mph in 6.9sec, with drive supported by a six-speed automatic transmission. Because fuel consumption figures and emissions data are calculated in a peculiar way, the Countryman is said to emit 49g/km of CO2 and manage 134.5 mpg. What is more accurate is that it has a 25-mile range on electric power alone, and a 2hr 15mins charging time when using a specialist 3.6kW wall box. Interested in buying a MINI Countryman?